Regular sessions by the DEC team resumed in the autumn culminating in collaboration in the acclaimed performance New moves, new sounds at the Pegasus Theatre on 3rd December with Oxford Improvisers as part of the 10th Cohesion Festival. For discussion of this occasion check out Oxford Dance Writers website. Following enthusiastic response to the Masterclass in March, BiSS hosted an evening of work in progress, New Dances at URC, 29th October 2011. Six Oxford dance artists working in a variety of genres showed emerging pieces and received valuable audience feedback both in discussion and in writing: Joe Lott, Ségolène Tarte, Amarita Vargas, Laura Peña, Paulette Mae and Susie Crow with musician Malcolm Atkins and visual artist Clare Bassett. Watch out for performances of some of this work in finished form at the Place in Resolution! (Joe Lott) and during the Dancin' Oxford 2012 Festival at the Pegasus Theatre (Amarita Vargas) and Old Fire Station (Paulette Mae). 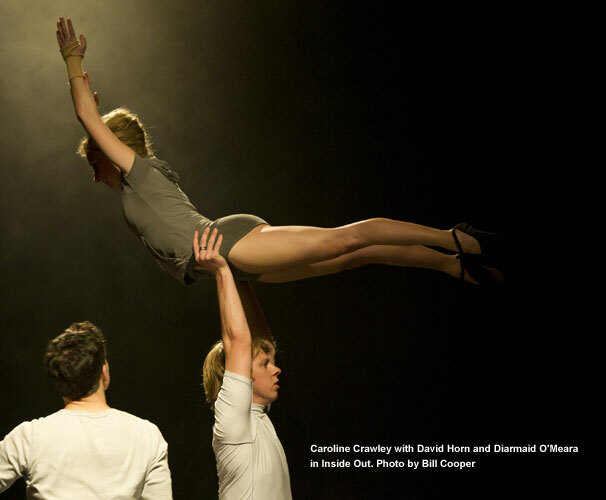 May-June 2011: Ballet in Small Spaces presented new works by Susie Crow. Imagined by and in memory of theatre director Sebastian Graham-Jones, Commedia captures the spirit of Claude Harrison's fantasy paintings of commedia del arte figures in landscapes, set to Robin Holloway's evocative Serenade played live by the Exuberant Players. Inside Out invites the spectator to see ballet from the inside; pianist Peter Jacobs and expert classical dancers interpret and reveal the lyrical beauty of Alan Bush's 24 Preludes. Stage designs are by Ellen Stewart, and lighting design by Guy Hoare. This project has been generously supported by the Exuberant Trust which supports emerging artists in Oxfordshire, and the National Lottery through Grants for the Arts. Production was facilitated by the Castle, Wellingborough and the North Wall. Performances took place at The Castle Wellingborough 18th May, The North Wall, Oxford (20th and 21st May), The Theatre, Chipping Norton (31st May), and Cornerstone Arts Centre, Didcot (2nd June). An Exuberant Trust Gala matinee performance at the North Wall on 21st May included Commedia and featured talented young artists who have been supported by the Trust. A further chance to see the highly successful Dante Project, this time in the beautiful setting of the Chapel of Mansfield Collge, Oxford on Sunday, 28th November 2010 at 8.00 pm. Talented dancers from Oxford are joined by the Cappe Sextet, with readings from Dante's Divine Comedy by Robin Kirkpatrick. Tickets available on the door, to reserve in advance please contact Susie. You can also download our flyer by clicking here. Following the work of DEC in April, Susie Crow, composer/improviser Malcolm Atkins and visual artist Antonia Bruce will be presenting improvised responses to Robin Kirkpatrick's poem 'After Prospero' at Robinson College, Cambridge on Saturday, 30th October as part of a day devoted to the Arts in Cambridge Festival of Ideas. Devised by Robin Kirkpatrick, the day will bring together artists, academics and students in performance and discussion around collaboration and improvisation. Further information can be found by clicking here. "Midway through life’s journey, I found myself lost in a dark wood…" Following the success of last year's Experience Dante performances at Robinson College, a dramatic programme of dance and music performed by BiSS and the Cappé Sextet, vividly re-imagining Dante’s journey of enlightenment through Hell, Purgatory and Paradise. Includes music by Beethoven, Ligeti, Cheryl Francis Hoad, Jeremy Thurlow and Roxanna Panufnik, with original choreography by Susie Crow.Booking information here. Richard Ramsey, and a new piece set to John Woolrich's "Ulysses Awakes"
Since October 2009 Susie Crow and Oxford based musician/composer Malcolm Atkins have been improvising in collaboration, taking as a starting point the poem, After Prospero, by Robin Kirkpatrick from Cambridge. The work was initially shown at Café Reason's Diamond Nights evening in October 2009 and then at Oxford Improvisers' Cohesion Festival in the Jacqueline Du Pré concert hall at St Hilda's College in November. Dancer and musician then teamed up with four visual artists with a longstanding interest in drawing dance; Clare Bassett, Antonia Bruce, Kassandra Isaacson and Susan Moxley. The group began meeting fortnightly to explore the interaction between art forms, including ultimately the use of video and projection. A residency at the OVADA gallery provided a chance to share not only resulting drawings, dance and music, but also working process, providing an intensive opportunity for the artists to develop their work, not only as individuals but in complex relationship in the moment and through live video projection. As part of the continuing dialogue they also began to explore a new poem by Robin Kirkpatrick, Envoi, written in response to their work in progress. The residency opened the work out to other local artists, enthusiasts and academics, through opportunities for guest improvisers across art forms to actively participate, an open drawing dance workshop, and a seminar on artistic collaboration and improvisation organised by Miranda Laurence under the Dance and Academia programme, which brings together arts practitioners and academics in discussion. Two accounts of the event can be read on the Oxford Dance Writers blog site. Susie Crow has recently worked with members of Cambridge University Contemporary Dance Group on “That Second Realm”, a new work with commissioned score by composer Jeremy Thurlow based on the Purgatorio. This was performed at Robinson College, Cambridge on Saturday 25th April as part of the Dante Experience, a programme of experimental works in music, dance, film, poetry, drama and visual arts inspired by Dante's Divine Comedy, organised by Dante scholar and translator Professor Robin Kirkpatrick. Following the success of this evening a further performance of a condensed version of the programme including “That Second Realm” was shown at Robinson College on Tuesday June 23rd. You can see the video of the performance on YouTube by clicking here. Two works from the Solos Project 2009 were shown as live interludes in themed screenings at the Ultimate Picture Palace in Oxford Documentary Film Festival (OxDox). Anuradha Chaturvedi'sTarana was shown with the documentary "Bilal" on Tuesday 21st April, and Boom and Bust with choreography by Susie Crow was performed by Debbie Camp alongside "Cityboy" and "I.O.U.S.A." on Friday 24th April. The Solos Project showcases the diversity of dance talent and professional practice in Oxford in the intimate surroundings of the Burton Taylor Studio Theatre. Artists based in Oxford and the surrounding area develop and present new solo works, reflecting the dance traditions they work within and their own individual ideas, experience and skills. It is curated by Susie Crow and hosted by Oxford Playhouse. Following the sell-out performance week of the first Solos Project in January 2008, a second Solos Project was programmed with performances in January 2009. This included an extra performance for a student audience as part of Dance Writers of the Future, a project aimed at encouraging student communities in Oxford to write about and review dance. 'The Solos Project' 2009' week, performed at the Burton Taylor Studio on the 14th to 17th January included an extra performance for a student audience as part of the Dance Writers of the Future, a project aimed at encouraging student communities in Oxford to write about and review dance. “Do not go where the path may lead, go instead where there is no path and leave a trail. ”Ralph Waldo Emerson"
Sound design by Steven Skinley including tracks: Beatbox Harmonica by Yuri Lane, Ave Maria by Celtic Woman and On by Aphex Twin. Music: Conlon Nancarrow, Studies for Player Piano 3b and 2B Mike Wofford, Quietsville from Morton Feldman Jazz Tributes. 'The Solos Project' 2008' week, was performed at the Burton Taylor Studio on the 9th to 12th January.